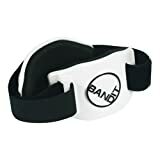 The BandIT arm band aids in the relief and prevention of pain associated with Tendinitis, Tennis Elbow, Carpal Tunnel Syndrome, Repetitive Stress Injuries and Cumulative Trauma Disorders sustained in the workplace or in recreational environments. The hook and loop strap around the two padded compressors adjusts for comfort and fit without inhibiting circulation. Ideal for sports, work and home use. One size fits most.